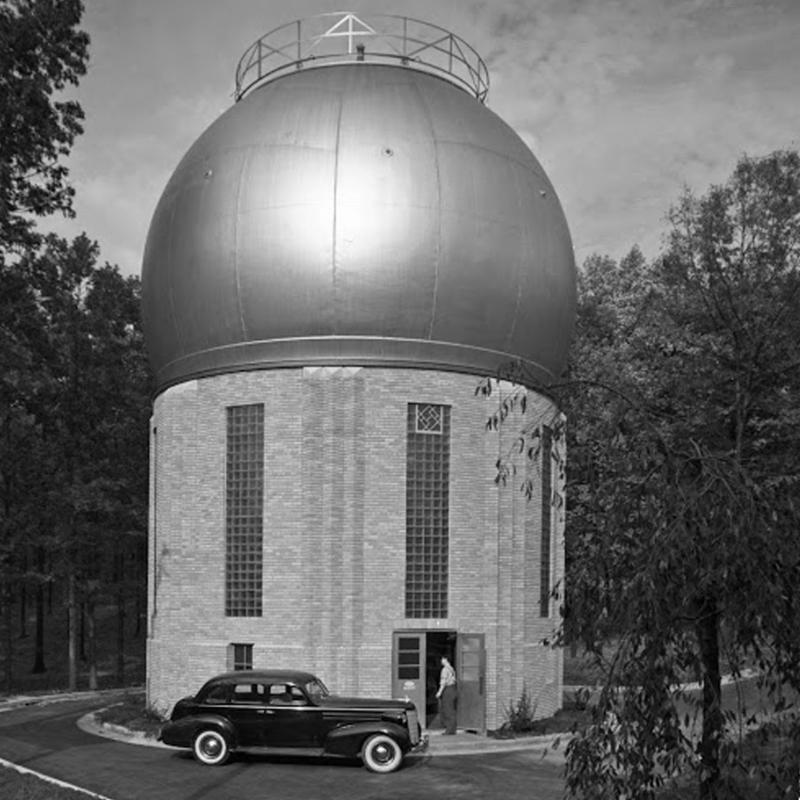 We learned recently of a fine Art Deco structure hidden in plain sight near Rock Creek Park in northwest Washington: The Atomic Physics Observatory on the Carnegie Institution of Washington campus on Broad Branch Road, NW. The structure is in danger of demolition. You can help preserve this deco gem. Constructed in 1937, the now-abandoned architectural structure housed a Van de Graaff particle accelerator, also known as an atom smasher. Though many such structures were built during the heyday of nuclear physics research in the 1930's, only a handful remain in the United States. The Observatory was an addition to the Carnegie Institution's research campus founded at the turn of the 20th when the location was quite rural. By the time the Observatory was constructed, the surrounding Chevy Chase residential neighborhood had become well-established. While the structure would have been perfectly serviceable without an architectural enclosure, the Institution thought it best to be a good neighbor and called on prominent local architect Edward Burton Corning to design an aesthetically pleasing exterior. Mr. Corning was conversant in several architectural styles and was responsible for many residences, commercial and civic buildings in the Washington area, including our favorite WTOP Radio Transmitter Station in Wheaton, Maryland. At roughly 40' in diameter and over 55' tall, the cylindrical domed structure looks much an observatory for viewing stars, but there is no telescope inside. Rather, the accelerator housed inside resembles a large ice cream cone, with a single "scoop" on top that forms the dome. Basically, the spherical dome (the "scoop") on top was used to generate large electrical charges that were then funneled vertically down the inverted "cone" and aimed at atoms in a chamber just below the ground. The Observatory's first experiments involved such notable physicists as Neils Bohr and Enrico Fermi. Work at the facility contributed to the development of the atomic bomb during the Manhattan Project the following decade. The Observatory continued to be used for experiments well into the 1960's but has sat idle since the 1970's. Mr. Corning's elegant architectural enclosure takes the form of a beige brick cylinder and features interesting vertical pilasters formed with angled bricks, large glass block panels and a nice complement of stone trim. The prominent dome was originally covered with heat reflective aluminum paint, but is now painted white. While no longer in use, the structure is in relatively good condition and is fully intact. Our friends with the DC Preservation League got wind of the structure's endangerment through their regular review of the District's list of demolition permits. Sadly, the Carnegie Institution is no longer interested in maintaining the structure and filed for a demolition permit earlier this autumn. Thankfully, the League's Landmarks Committee took notice, discovered what was at risk, and in very short order put together a very thorough and thoughtful Landmark Designation Nomination. A hearing with the District's Historic Preservation Review Board is set for December 15th, at which time it is expected that the Board will rule on Landmark designation for this significant structure. 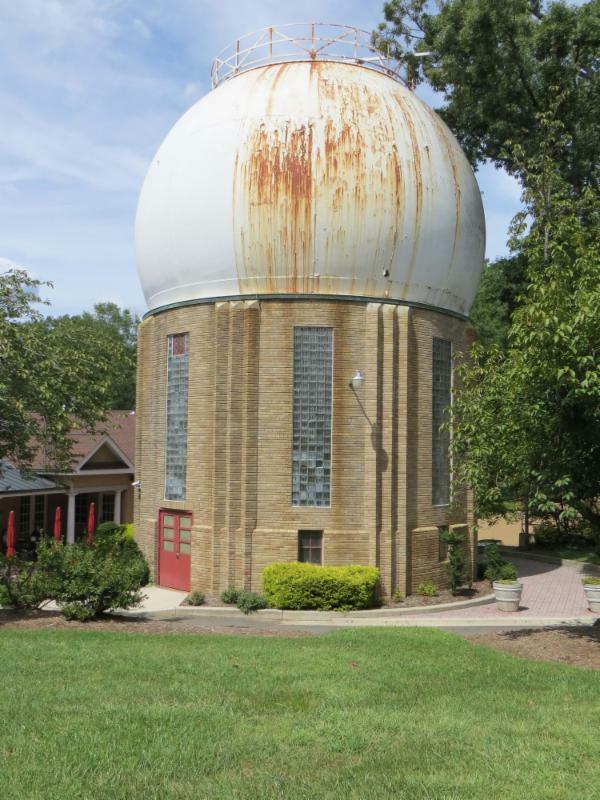 We hope you will take a few minutes to support the Landmark Designation of the Observatory. Not only is it of merit for its fine Art Deco exterior, but it is also important to our history as well. Brief letters of support can be submitted to The Historic Preservation Review Board or you can testify at the hearing. Please act quickly: the hearing is scheduled for December 15th. The property name and address are Carnegie Institution of Washington, Atomic Physics Observatory, 5241 Broad Branch Road, NW, and the case number is 17-01. Comments on a case pending before HPRB and materials intended for distribution to individual Board members should be addressed to the Chair. HPRB members prefer to receive advance copies of written comments and documents submitted for their monthly meeting, so materials intended for advance distribution to HPRB members must be received by HPO before noon on the Thursday one week before the HPRB meeting [December 8th, in this case]. For brief comments of no more than two pages, one original copy is acceptable. Letters and other materials may be submitted by email tohistoric.preservation@dc.gov, by fax to (202) 442-7638, or by regular mail or hand delivery to the HPO office at the following address. If you wish to testify at the meeting, you may do so by coming early and filling out a card.